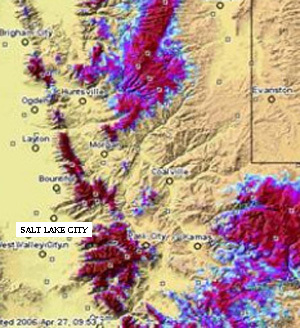 It’s no longer a matter of if it will flood along the Wasatch Front. Just how big? & how bad? Rivers are surging high on their banks: Millcreek, Parleys, the Jordan River, Emigration and the Cottonwood canyons are flowing at dangerous levels. Sugar House Park pond is over the grass. 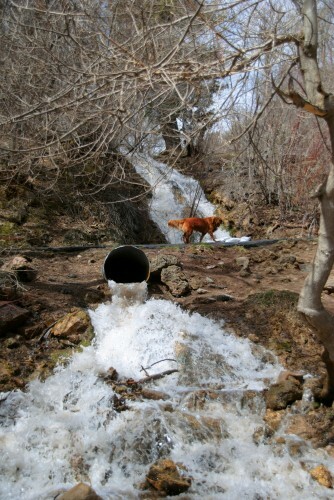 Emigration Canyon has already flooded and in April the precipitation has exceeded 200% of normal. All the runoff we have seen so far is from rain only and the mountains still have 175% of normal snowpack. These facts resound an important question: should we be worried about floods? And better than what the main stream media reports, if we should be worried what should we do? According to Brian McInerney, Hydrologist for the National Weather Service, predicting the next big flood is as uncertain as predicting the weather. Q: Which rivers are most likely to flood? Q: Should Salt Lake City residents start sandbagging? What do we need to get prepared? A: That’s your local Salt Lake City Public Works Department—they can give you sandbags and advice if you are worried. 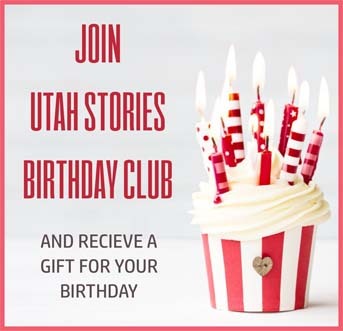 The local newspapers continue to compare the current situation with 1983, when State Street became a river and hundreds of Salt Lake City homes became flooded, causing millions of dollars of damage. According to McInerney the situation that created the disaster we saw in 83 had less to do with snowpack and more to do with a cold and wet May followed by a huge temperature spike in early June. In addition, rivers banks hadn’t been cleaned of debris, and a big debris clump formed where the City Creek flowed into a pipeline traveling under North Temple. This clog forced City Creek to make its own path down State Street. There is a photo in the archives of a man who caught a fish on State Street in 83, so maybe something to look forward to! McInery provided his last forecast before we printed this magazine on April 26th; the following weekend more snow is forecast for the mountains. This amount of snow this late in the year is completely unprecedented. McNeiry shows graphs and charts that make the point. Every prior year when snowpack was huge, the line in the graph starts heading down by the second week of April. The line for 2011 continues to climb and climb and this weekend it will likely climb more. The biggest challenge we face now is too much more cold and wet weather and/or too much hot weather too fast. Reservoir operators have a very difficult task of draining enough water quickly to make room for the water to come. If dam operators can’t keep up we risk overflowing our dams. When we spoke with McInerney he described the near—catastrophe that occurred in 1983, when Glen Canyon Damn couldn’t keep up with the water. Water was shooting from the dam at maximum capacity until chunks of concrete began to dislodge from the extreme pressure and flow of water. The reservoir operators have a very difficult job because they need to balance the retention of water for our usage and empty reservoirs enough for the coming deluge. It might be time to start building an ark in your backyard in your free time. Ruth’s Diner already received an early dose of flooding after Emigration creek went over it’s banks and started flooding their patio. Ruth’s Manger Michael Hales says, “We see this as a good warning, we are preparing for more flooding and this is just a shot across the bow.” Ruth’s is now prepared with hundreds of sandbags ready to divert water away from their building and further downstream. 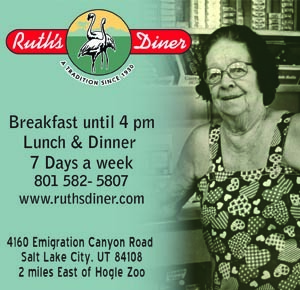 The previous flood caused no damage and Ruth’s is open for business as usual. Emigration Creek-The risk here is for the homes along the creek and near the bottom of the creek (near Ruth’s Diner). The CFS for this creek is 130. Most people don’t die from floods staying in their homes. Most die by falling into fast water. And children are the most at risk. When rivers, creeks, irrigation ditches, canals run high, naturally people are attracted to the spectacle. But if someone falls in, it can be a death trap: freezing run-off water temperatures, hypothermia occurs within two minutes. Small children, pets and adults risk getting carried away by crossing streams when it’s running high and fast. Like the boy scouts recently encountered at the Jordan River. With the high water tables right now – make sure your sump pump works! If you have had problems with basement seepage—you will have more problems this year. A sump pump is basically a water pump that keeps the water table under your house at a manageable level. Many homes come with this feature, but many do not. 1. If your home is certain to flood relocate and elevate (at least 12” above flood base elevation) those items such as the electrical box, water heater, washer and dryer, etc. b. Sandbags or other types of barriers for around potential damage areas. Another option is Hydra barriers – an effective, economical alternative to sandbags. The Salt Lake City Public Works Department has more on this. 2. Make a plan on how to take care of your pets. Visit www.uearc.org for the specifics. 3. Homeowners insurance doesn’t cover floods, so if your home is near a creek that is expected to flood, work with your neighbors to protect your homes collectively. Water paths can be diverted quickly when many people worth together as a team. Michael Hales from Ruth’s said, “I saw complete strangers who drove up just to help us fill and carry sandbags.” Currently the Logan Valley, Weber Valley and Little and Big Cottonwood are the most likely to flood. But start watching the forecast, watch irrigation ditches near your home and prepare for the worst. 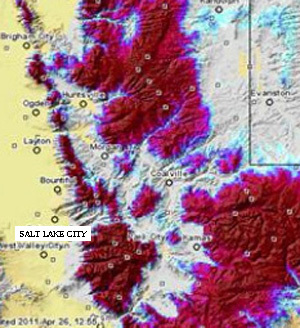 The six creeks basin flood forecast covers the area just to the east and north-east of Salt Lake County. 2006 had the highest record of snowpack (since they began keeping records) by the third week of April in 2006 the snowpack began melting, currently snowpack is still climbing. The Wasatch Front is currently 183% of normal mark. The most probable forecast is that the Big and Little Cottonwood Creeks will flood hitting above 800 CFS. And with a storm forecasted for this weekend the snowpack will continue to climb. Normal flow for the Little Cottonwood Creek’s average flow is at 400 CFS. This means we are very likely to see flooding and water flow twice as strong as normal. Also City Creek, currently has a 10% probable forecast. If the weather remains cold and wet for even one more week this could easily exceed a 50% chance of flooding.